Oh my goodness, have you seen the wonderfully unique wedding couples from Concarta?! 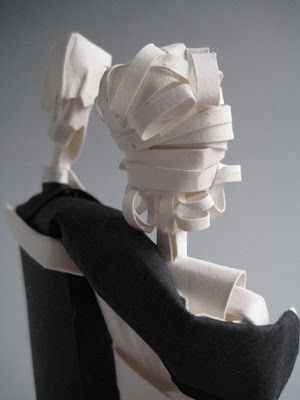 Gwen of Los Angeles creates whimsical paper figures... each is incredibly imaginative, beautifully detailed, and precisely constructed. 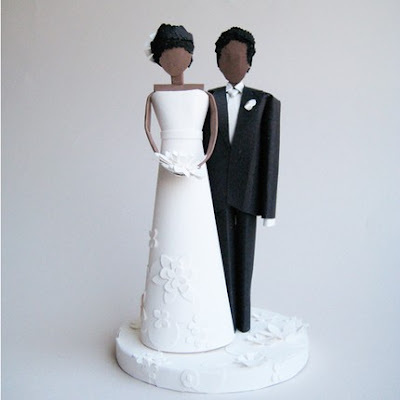 At just 6-7 inches tall, they would be perfect on top of a cake or to call attention to a seating chart or guest book. Gwen has a fine art background and has always loved working with paper - drawing, painting, experimenting with pattern-making, making props for her artwork, and doing store displays. Her shop is quite new, having just opened at the end of January, but it's already attracting a good bit of attention. Gwen thought designing wedding cake toppers would be an interesting experiment and would give her the opportunity to explore making a variety of design-oriented objects. 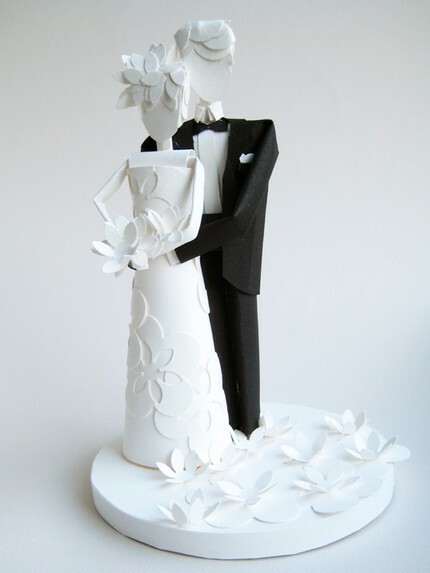 She was married at the end of last year and intended to make her own topper, but completely forgot... no doubt she's getting it out of her system now! 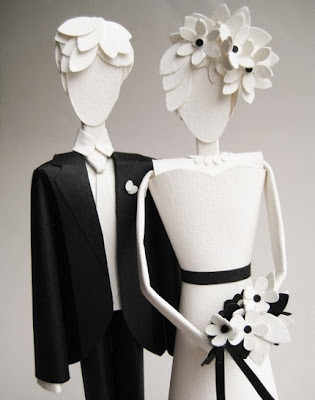 Gwen will be happy to custom design a couple that resembles you and your intended, and can work in extra little details... your dress and hair style, color scheme, and maybe even a pet! 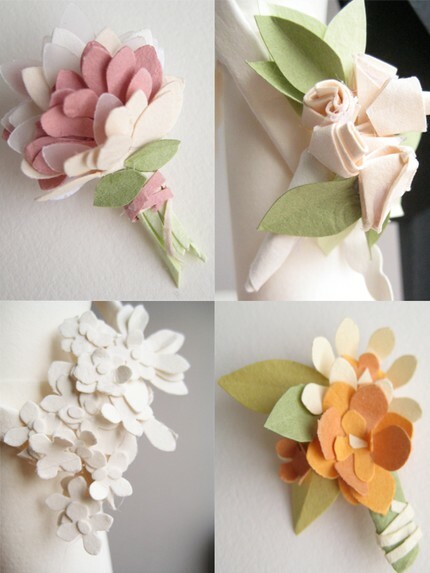 See more examples of marvelous brides, grooms, and paper flowers at Gwen's Concarta Etsy shop. Ann!!!!!!!!! How did you discover such lovely work???? 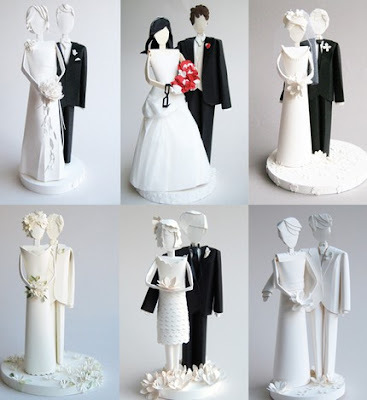 These are absolutely amazing, thanks a lot for sharing!!! 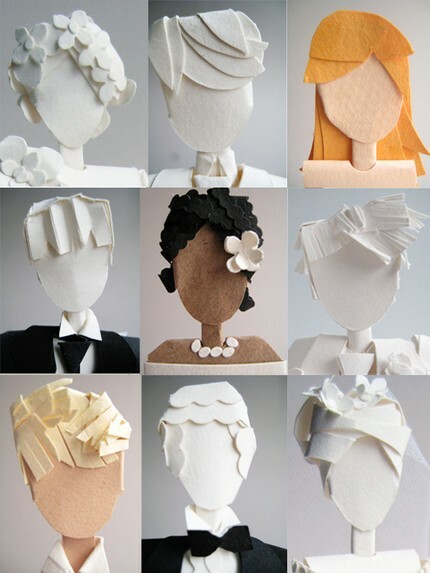 Can't find words to describe these creations.Gwen is a genius.Thanks for sharing. oh WOW! this is seriously amazing work! share this art so beautiful! I said WOWWWW by seeing these beautiful couples!!!! Such an amazing talent Gwen! Thanks for sharing Ann.. These are just GORGEOUS! Love them! It's FABULOUS and really amazing ! Thanks a lot for sharing ! They are just adorable!!!! I love them all!!! i adore all of this paper art you are featuring! inspiring! they are so beautiful, especially the hair! That is SO precious... beautiful details, wow! aww, these are too gorgeous!! i'm so jealous!